The North East Victorian Wine Region takes in Rutherglen, Glenrowan, Beechworth and King Valley wineries. Indulge in some of Australia’s finest food and wine, stopping along the way at wineries and breweries such as Baileys, Morrisons, Auldstone from Glenrowan region, Scion, Jones, Wicked Virgin, Cofield from Rutherglen region Pennyweight, Amulet, Indigo from Beechworth region and La Cantina, Dal Zotto, Red Feet, Gracebrook and Chrismont from King Valley region. North East Vineyard Tours is a family-owned business. Your host Lou has been involved in tourism and hospitality for many years and has a reputation for quality, personalised service. Lou has previously conducted wine tours in the Hunter Valley for four years, creating a rapport with wineries and accommodation providers. He now continues with service and expertise in the North East Victoria Wine Region and invites you to join him in experiencing your unforgettable visit to the North East Victoria Wine Region. 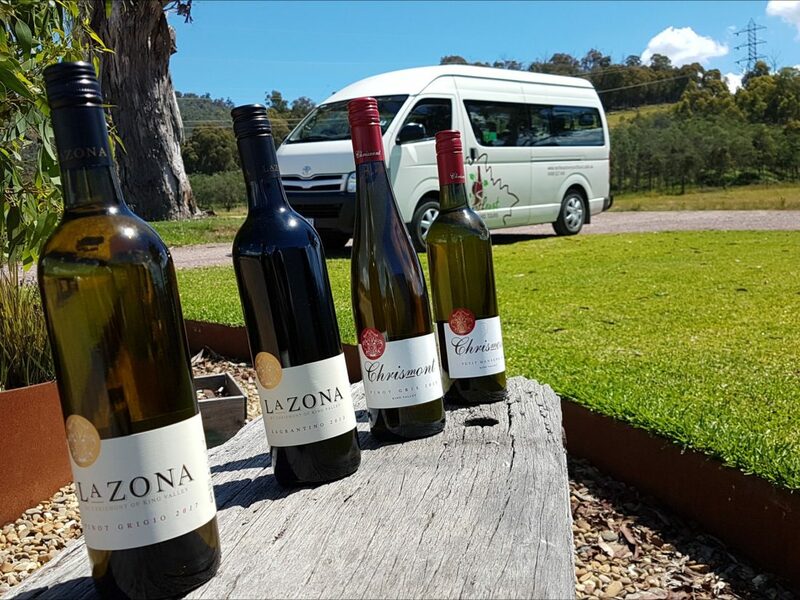 North East Vineyard Tours departs from your accommodation at Benalla, Rutherglen, Mansfield, Wangaratta, Beechworth and Milawa. Offering door-to-door pick-up at your home, accommodation, or other convenient location by arrangement. Catering for groups of any size, our friendly staff can design a package to fit your specific needs, interests and budget. North East Vineyard Tours will pick you up from your accommodation between 9:45am and 10:15am. You will then relax and enjoy the best the Rutherglen Wine Region has to offer in air-conditioned comfort on this guided tour. During the day you will visit four of the smaller cellar doors and vineyards, sampling different wines at each. As North East Vineyard Tours specialise in small group wine tours, they only use 12-seater mini buses, just enough people to get to know one another. There are over 29 cellar doors and vineyards in the Rutherglen Wine Region. Cellar doors visited include Scion, Cofield, Wicked Virgin, Jones, Chambers, Campbells, Pfeiffer and Buller Wines. The cellar doors and vineyards visited will vary on any given day depending on opening hours and particular requests. Lunch is not included in the price as many visitors are either eating out in the evening or want to have a more substantial lunch and snack in the evening. Cost for lunch ranges from $12 to $25. Return to your accommodation between 4:30pm and 5:00pm – in time for a nap before dinner. North East Vineyard Tours will pick you up from your accommodation between 9:45am and 10:15am. You will then relax and enjoy the best the King Valley Wine Region has to offer in air-conditioned comfort on this guided tour. There are over 20 cellar doors vineyards in the King Valley Wine Region. These include La Cantina, Sam Miranda, Gracebrook, Dal Zotto, Pizzini and Christmont finishing off with a visit to a Milawa Cheese. The cellar doors and vineyards visited will vary on any given day depending on opening hours and particular requests. North East Vineyard Tours will pick you up from your accommodation between 9:45am and 10:15am. You will then relax and enjoy the best the North East Victoria Wine Region has to offer. There are over 80 cellar doors and vineyards in the North East Victoria Wine Region, with North East Vineyard Tours visiting from a selection of about 20 of these. The region takes in Beechworth, Glenrowan, King Valley and Rutherglen. The cellar doors and vineyards visited will vary on any given day depending on opening hours and particular requests. North East Vineyard Tours will pick you up from your accommodation between 9:45am and 10:15am. You will then relax and enjoy the best the Beechworth Wine Region has to offer on this guided tour. There are over 13 cellar doors in the Beechworth Wine Region, with North East Vineyard Tours visiting from a selection of about four of these. Wineries visited are Pennyweight, Amulet, Indigo, John Gehrig and Brown Brothers along with a visit to the Milawa Cheese factory for a tasting. The cellar doors and vineyards visited will vary on any given day depending on opening hours and particular requests. North East Vineyard Tours will pick you up from your accommodation between 9:45am and 10:15am. You will then relax and enjoy the best the Glenrowan Wine Region has to offer in air-conditioned comfort on this guided tour. There are four cellar door vineyards in the Glenrowan Wine Region, with North East Vineyard Tours visiting each one. Cellar doors visited in the Glenrowan region are Morrisons, Baileys of Glenrowan, Auldstone Winery and Booths Taminick Cellars The cellar doors and vineyards visited will vary on any given day depending on opening hours and particular requests.